DuSable Campus students organized a sit-in to get CPS to bring back their librarian. 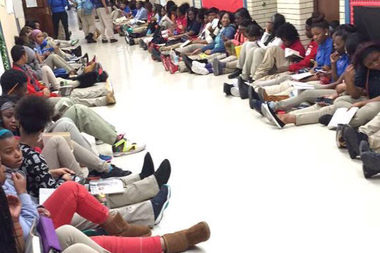 Students grabbed books from the school library, 4934 S Wabash Ave., and took a seat on the floor in the hallway to conduct a "read-in" or "sit-in." CPS officials did not immediately confirm the cuts, but the Chicago Teachers Union tweeted that "Rahm & CPS" closed the library and laid off the librarian, Sara Sayigh. Sabaria said the librarian is “the heart of the school” and the students want her back. “We had all students sit in the hallway, silently, to get viral attention from the chief executive of all public schools,” Sabaria said. Their hash tag #saveourlibrary has been getting retweets all morning. Some 240 people have signed a petition saying "we implore CPS to save the library." “Libraries are essential to all CPS schools, not just Dusable,” Sabaria said. “Without resources and reliable people, such as librarians, our resources are limited. Being on the South Side of Chicago is already a huge disadvantage." News of the impending layoff gathered steam on social media throughout Friday. A Change.org petition, directed at CPS CEO Forrest Claypool, collected 115 signatures out of a goal of 200 by Friday night.